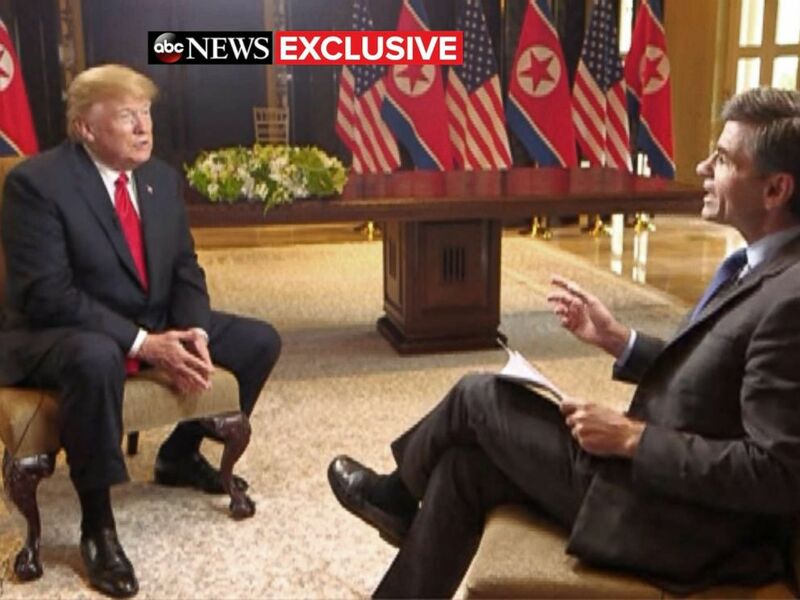 North Korea will denuclearize, President Donald Trump declared in an exclusive interview with ABC News chief anchor George Stephanopoulos just hours after intense and historic negotiations with North Korean leader Kim Jong Un. President Donald Trump sits with ABC News’ George Stephanopoulos after a historic summit with North Korea’s Kim Jong Un at the Capella Hotel on Sentosa island in Singapore, June 12, 2018. 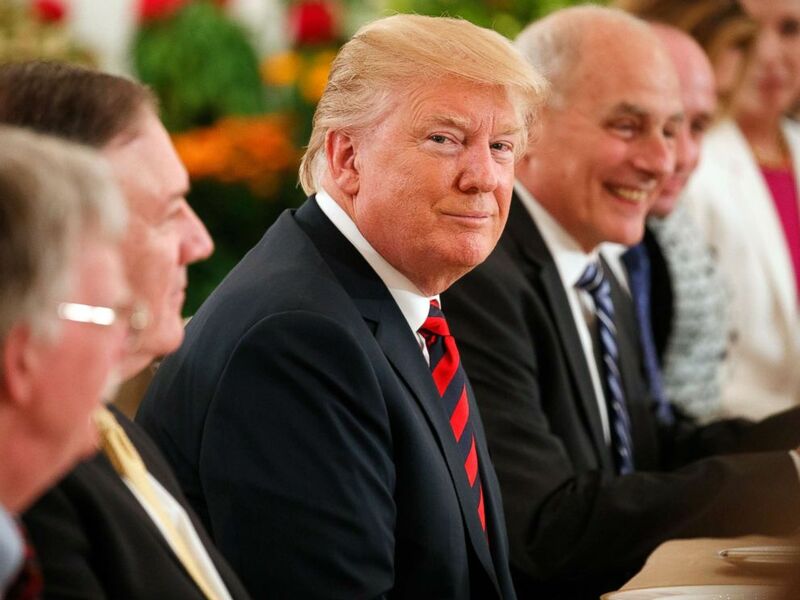 “He really wants to do something I think terrific for their country,” Trump said of Kim. The meeting in Singapore marked the first time a sitting U.S. president met face-to-face with a North Korean leader. The two discussed North Korea’s nuclear-weapons program, and a potential deal to denuclearize the communist country. About 45 minutes after going into the private meeting, Trump told reporters that his one-on-one with Kim had been “very, very good” and said the two have an “excellent relationship.” Kim did not respond to shouted questions about whether he will give up his country’s nuclear weapons. Kim smiled as the translator interpret the Trump’s comments, before issuing a brief statement of his own. The stakes going into the meeting were high for both leaders, who have respectively belittled each other with name calling prior to the summit. Trump arrived in Singapore on Sunday night, flying on Air Force One directly from the G-7 summit in Canada. Kim got to Singapore several hours before Trump aboard an Air China plane and complimented his hosts for the accommodations during a meeting with Singapore Prime Minister Lee Hsien Loong at the Istana Palace, the official residence of the prime minister. “I have the expectation that this will be very successful,” Kim, speaking through an interpreter, told the prime minister. The United States has imposed various economic sanctions against North Korea over its weapons program in recent years. Since taking office last year, Trump said he’s been hoping to secure a deal with North Korea in which Kim would relinquish his nuclear arsenal. The White House announced the upcoming nuclear summit last month, but diplomatic peace didn’t last long. 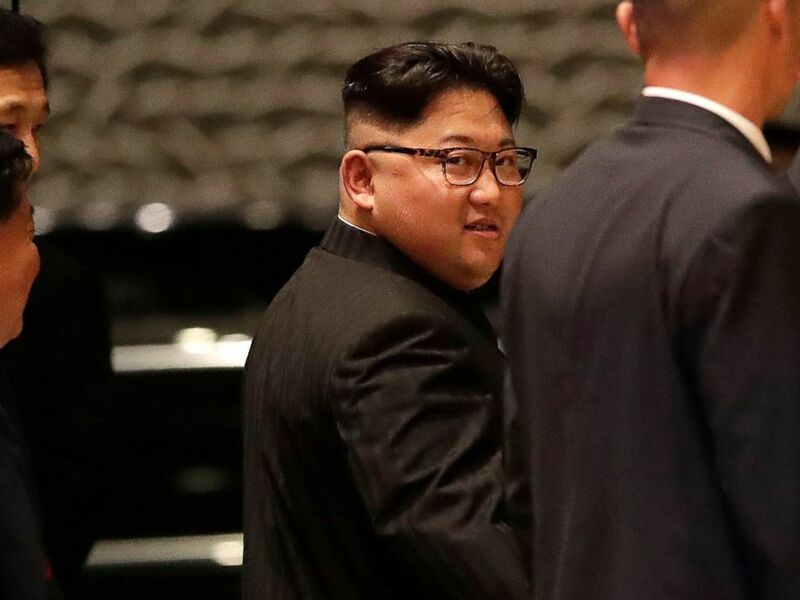 Kim threatened to pull back from the meeting and criticized the United States with fiery rhetoric. In response, Trump called off the planned summit in an official signed letter. 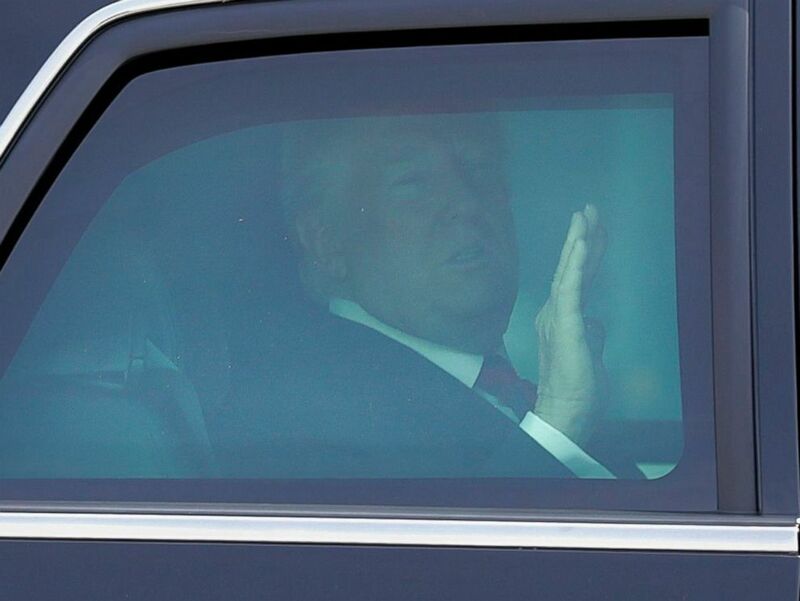 President Donald Trump waves from inside his car as he heads into the Istana Presidential Palace, where he will meet with Singapore Prime Minister Lee Hsien Loong, 11 June 2018. Trump returns to the White House with more diplomatic problems on his plate with some of America’s closest allies, chiefly Canada. Trump departed the G-7 summit in Quebec having angered American allies over his administration’s move to impose steep tariffs on aluminum and steel imports from the European Union, Mexico and Canada. 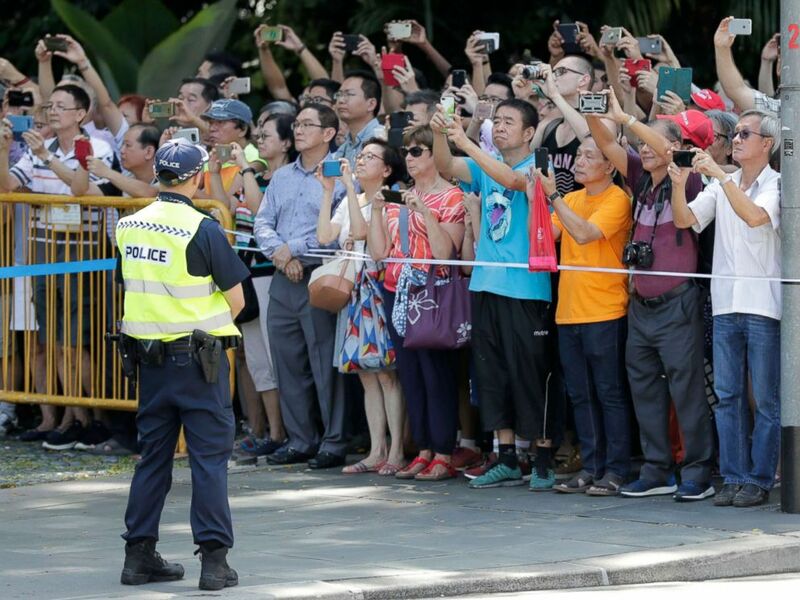 Singaporeans gather in front of the Istana Presidential Palace, where President Donald Trump and Singapore Prime Minister Lee Hsien Loong will meet in Singapore, June 11, 2018. Trump said on Twitter that Trudeau was “meek and mild” during the summit and was “very dishonest and weak” during his post-summit news conference. Officials from Trump’s administration ganged up on Trudeau.